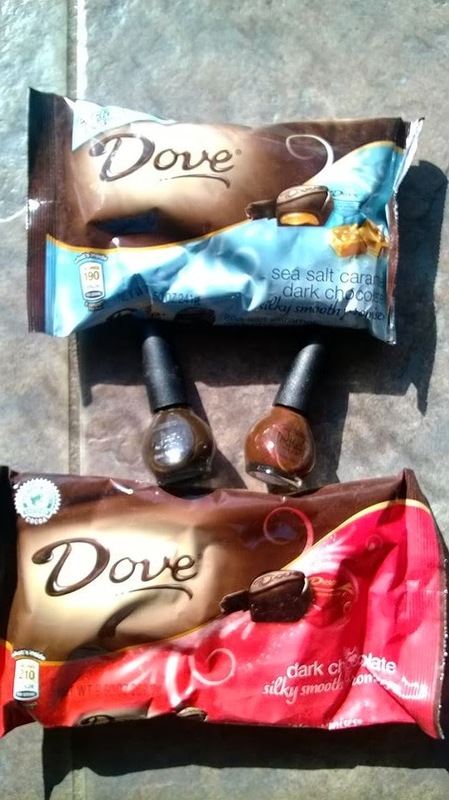 ThemeParkMama: Dove Sea Salt Chocolates YUM! Giveaway Ends 2/25! Dove chocolates are already great on their own but now they have become a little more healthy with sea salt. Dove has introduced new DOVE® PROMISES® Silky Smooth Sea Salt Caramel Dark Chocolate. I really love Dove chocolates and seems like I am not alone with Dove being the #1 solid dark chocolate on the market! Congrats Dove! So why not make it better and get more fans with the new DOVE® PROMISES® Silky Smooth Sea Salt Caramel Dark Chocolate. The new sea salt chocolate is great it offers better health benefits and taste better then ever. DOVE® PROMISES® Silky Smooth Sea Salt Caramel Dark Chocolate is the perfect combination of sweet and salty making for a truly great enjoyment of chocolate. With the launch of this new great product from Dove they are offering my readers a chance to win the prize pack below! Two exclusive NICOLE® by OPI nail lacquer shades are great products which go with almost everything very earthy. Enter to win the kit by filling out the rafflecopter below. Contest will end Feb open to U.S. residents only. I love the milk chocolate. I like Dove's PROMISES Silky Smooth Mint & Dark Chocolate Swirl chcolates. My favorite is their Dark Chocolate. I wasn't able to find the hearts anywhere this Valentine's. I like the milk chocolate. I love their Milk, Dark, and Dark Hazelnut. Pretty much everything they make! The Dove Milk Chocolate is my favorite. My favorite is the Dove Milk Chocolate! I love their Dove Milk Chocolate! my favorite is the peanut butter dove chocolate. i am tony l smoaks on rafflecopter. My favorite Dove products is their Dark Chocolate.